Vote forThe Whitsundays, QLDTop Major Destinations Which are Australia's must-experience spots? You help us decide. When one attempts to conjure up mental images of the perfect Aussie island getaway, Queensland’s Whitsundays chain – with its cavalcade of islands covered in idyllic white sands and surrounded by crystal-clear, reef-rich waters – are always one of the first destinations to spring to mind. 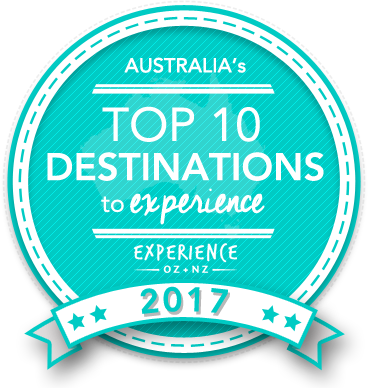 As the 2016 and 2013 winner of Australia’s Top 10 Destinations to Experience as well as runner-up for 2014, the archipelago is a much-acclaimed escapist destination that symbolises what an island getaway is all about. With a postcard-perfect scene awaiting around every corner, it’s a favoured destination of honeymooners and regular holidaymakers alike. With the many and varied natural wonders of the Great Barrier Reef at their doorstep, the majority of the Whitsunday‘s individual islands (“officially” numbering 74 in total, but in reality many more) are a paradise in and of themselves. From Hamilton to Hook and everywhere in between, travellers to the Whitsundays can expect a bevy of marine and beach-based entertainment and leisure options along with a healthy dose of relaxation amongst picture-perfect surroundings. This is a luxurious destination that offers a climate and atmosphere similar to that of international destinations such as Fiji without much of their excess humidity. Each island offers something slightly different and just that little bit unique to the rest of its family, with some specialising in more developed resort-style facilities and others focusing on eco-tourism with an emphasis on all-things-marine – and many others uninhabited. Exactly which island in the Whitsundays chain will provide the best balance is entirely up to you; regardless, they are the closest thing to Australia’s own Bora Bora that you’re likely to come across in domestic waters. Highlights abound in the Whitsundays – of particular note is the acclaimed Whitehaven Beach on Whitsunday Island, winner of our “Top Beach in Australia” award after polling the Australian public, but there are many other points of significance that contribute to the region’s beauty. This emphasis on marine activities means there’s a ton to see and do when paying a visit to the islands; cruises to the Reef for snorkelling and diving are of course incredibly popular, while other activities both on the surface of the sea (jet skiing, ocean rafting and more) and on land (beach activities or simply lazing amongst the perfect surrounds) offer options that can be either as energetic or relaxed as you so choose. Spending time and staying in the Whitsundays can be done either by basing yourself out of the mainland at Airlie Beach (its Abell Point Marina and Port of Airlie are largely used as the main springboard out to the water) or by booking accommodation on one of the islands themselves; each of these methods has their own advantages, and while staying on an island may be the pinnacle of exclusivity, it’s also quite easy to take a day tour from the mainland. The mainland of the region is no slouch itself, either; there's plenty of opportunity for land-based exploration of lush national parks, spotting local bird life and enjoying walking trails - many of which come complete with stunning vistas, pristine waterfalls, and more. Still as beautiful as ever, if you’re dreaming of white, sandy beaches, crystal blue water, diving amongst thousands of tropical fish or sailing within one of the most beautiful archipelagos in Aussie waters, the Whitsundays check every possible box. Looking to pay a visit to The Whitsundays but not sure what to do? Here are some of its most essential experiences. What's new in The Whitsundays in 2016/2017? The region continues to bounce back after the impact of severe weather, with the majority of its tour operator and accommodation offerings as good as ever. Need more info on The Whitsundays? Check out our detailed travel features on this top spot below. With so many islands and stunning environments to choose from, selecting how to best spend your time in the Whitsundays can be an (enjoyable) problem. Don't miss these 10 experiences! While it's got a reputation as a classy romantic getaway for couples, the Whitsundays region also caters for those travelling as families. Here are some top ways to keep the kids entertained. A year-round warm destination that's never cold enough you away, there's one special time in particular in which the Whitsundays truly shines. We take a look at the best time to visit in detail here. Is The Whitsundays Australia's Top Major Destination to Experience for 2017? Vote now for the chance to WIN an epic trip to one of Australia's top destinations!